A car that's exceptionally happy in the sun. Would you like to have an electric car that charges itself as you drive? It sounds too good to be true, but that’s exactly what the Munich-based start-up company Sono Motors is working on. 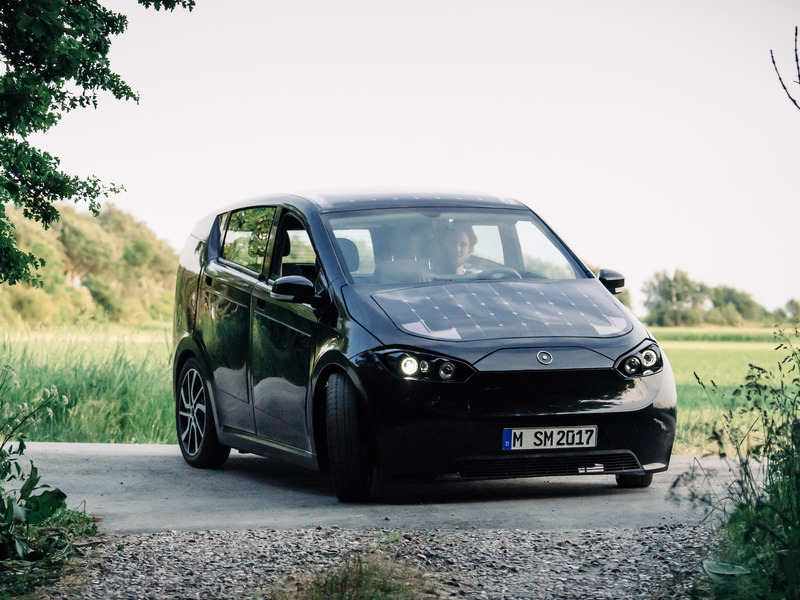 Sono is developing a fully electric vehicle it calls Sion that uses solar cells integrated into the bodywork of the vehicle. There are really solar cells all over it. The car can be charged by the sun when it’s parked or as you drive down the road. The car can also be plugged right into a conventional power outlet or an outlet specifically designed for electric vehicles. With all these options, range anxiety should be much less of an issue. The car’s basic hatchback shape doesn’t look all that outlandish, but the obvious solar cells for its body panels give it a very futuristic look. Also, the interior of the car is a little funky. On first glance, you see a simply laid out cabin, but upon further scrutiny, it becomes clear that there’s actual moss integrated into the dashboard. This is supposed to facilitate air filtration and humidity regulation. The moss, according to Sono, doesn’t require any special care to maintain, but we think we’d rather just have the solar cells be the only weird thing about this vehicle. The vehicle will have 330 different solar cells across the vehicle’s roof, hood, and side. The battery system when fully charged will offer around 155 miles per charge. The solar cells along can generate enough electrical power each day for around 18.6 miles of range. That means you’d likely still have to plug in the car from time to time. In addition to the stats listed above, the car will come with air conditioning, a trailer hitch for towing around 1,650 lbs, ABS, ESC, an alarm system, and airbags. Cools screens but all we see is the neon green moss. Sono hasn’t started production yet, but it plans to begin in 2019. There have been about 5,000 orders already and the price will start at $18,540. That’s very reasonable for any type of car, let alone one packed with such innovative technology.